Previously, I have read Genevieve Graham’s Tides of Honour, which is a love story set during WWI and the Halifax Explosion. 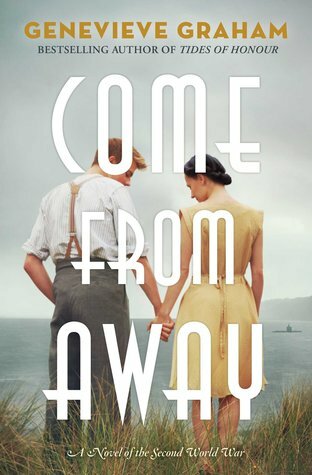 Come From Away takes place during WWII, a generation later. Danny and Audrey Baker’s children are grown – their three boys away fighting in the war and their daughter, Grace, at home with them. Genevieve Graham likes to place her stories in the middle of historical events – in this case the presence of German U-Boats along the east coast of Canada during WWII. In the prologue, Graham explains that “between 1942 and 1944, fifteen U-boats infiltrated Canadian waters, sinking twenty-three ships”, including the passenger ferry that runs between Cape Breton and Newfoundland, killing 136 people. Ms. Graham also explains that there are legends that persist along the Eastern shore of Nova Scotia, one of which involves a group of German U-boat sailors that snuck into a local dance. Genevieve Graham took this tale and imagined what might have come of it. Grace Baker feels at odds, like she should be doing something more useful, to help out with the war like her brothers, rather than just working in the local general store. But she loves working at the store, and her parents already have three children at war to worry about. Grace’s narration of the story alternates with Rudi’s, a German sailor who goes to the local dance and ends up dancing with Grace. When Rudi’s U-boat gets destroyed, he is the only survivor. He finds a cabin in the woods well stocked with trapping equipment, and from time to time he goes into “town” to trade his furs for provisions at the store, where he and Grace further their acquaintance. Rudi is eventually found out, and the Baker family has to decide whether or not to let him hide out on their property. Is he a spy? Can they trust him? And how does Grace feel knowing that the man she’s falling in love with is a Nazi? Fans of Tides of Honour will be happy to get back to the Baker family. And fans of historical novels will enjoy this unique setting. I found the quiet home front setting enjoyable to read about… with family members wondering and worrying about the war and their loved ones; imagining the worst yet hoping for the best. And Grace’s three brothers all make an appearance, bringing in discussion about the effects of war on soldiers and their families. Because of the nature of Grace and Rudi’s relationship, there’s also an exploration of good versus bad. The allied countries are taught that the Germans are nasty and evil, and that there’s no such thing as a good Nazi. It’s hard to change your perspective when you have hard evidence in front of you of what the German’s have done to your sons/brothers/husbands. In reality, Rudi may have been worse off, but we’re talking about the Bakers here, right? And in Genevieve Graham’s books (so far), love has always conquered all. I love this first line: The bittersweet truth these days was that there was a lot less laundry to hang. My review of Promises to Keep, Genevieve Graham’s novel about the Acadian Expulsion. I’m not big on sap and happy endings either, but I have discovered that it’s fun to throw them in every once in a while. And I can learn some Canadian history while I’m at it! The Acadian expulsion sounds more interesting to me as a topic. Which of the books do you think is better? I’m always conflicted by novels like this one, as the author can go either way, but, usually, as in this case, because it’s a romance, tends to gloss over everything for the sake of said romance. Not usually my cup of tea to begin with. If you’re looking for more history, less love story, I’d recommend Promises to Keep. However, I enjoyed them all, even though this genre isn’t usually my cup of tea, either. I will continue to read them as long as she keeps writing them! This sounds like a nice comfort read – sometimes sap and happy endings are just what we need! I like the issue around whether a Nazi can also be a good person. I remember your review of the other one by her – I think I need to give these a try! That is just a fantastic line. I’m glad to have read your review and when I am next in that reading mood I will keep it in mind. The attention to consistency in tone and presentation (love the cover images and page layouts – inviting and easy to read) of her books and all the qualities you’ve described so well — all make me wish that I was in that reading mood more often. Yes, it was my first (and only). If next summer is going to be this hot, I will need a few books like this for relief. I’ve grown tired of WWII stories, especially since they’re quite trendy right now, but this one sounds interesting. I think the reason I get tired of World War II stories is because people seem to think that that was a very clear-cut war, good versus evil with no questions. It would be really hard to set a historical romance novel during the Vietnam war, for example, because no one really knew what the hell they were doing. In this book the author avoids having it be very black and white, which is cool. It’s definitely not a typical WWII story, The setting is on the home front, for one thing. And it does explore that grey area of good and evil – I was impressed with how she did that.